Step Back in Time at Lyndhurst's Little Red Schoolhouse ~ The History Girl! Along Riverside Avenue in Lyndhurst, New Jersey are three historic structures listed on the State and National Registers of Historic Places. Each site is connected to early education in what is today the Township of Lyndhurst. Two of the structures help tell the narrative of the third, the River Road School, or Little Red Schoolhouse, a quintessential one-room schoolhouse topped by a cupola and bell. The first schoolhouse at the corner of what is today Riverside and Fern Avenues was built in 1804 in what was then called New Barbadoes Neck. In 1804, Jacob Van Winkle presented land for the sole purpose of the school's construction. Jacob's home, located only one block away from the school, was built in 1797. The Jacob Van Winkle House is a Dutch sandstone home with a gambrel roof and today houses a Masonic Club. It is the oldest home in Lyndhurst. The school, just a short walk down the street, was one of the first public school buildings built in Bergen County at a cost of $162.20 raised by subscription. Rent for the land was one peppercorn, if demanded. The 1804 school stood until 1849, when a new, two-story building replaced it. In 1893, the building was torn down and sold to a Mr. Conley for $35.00. That same year, the current River Road one-room schoolhouse was built at a cost of $2,541.83. The cupola and bell from the 1849 schoolhouse were salvaged and added to the current building. The building's front entrance, facing Riverside Avenue, has an entrance door on each side of the a vestibule, or cloakroom, which is most likely where the children hung their coats. The side walls of the building feature three tall four-over-four windows, which provided plenty of light for the classroom. 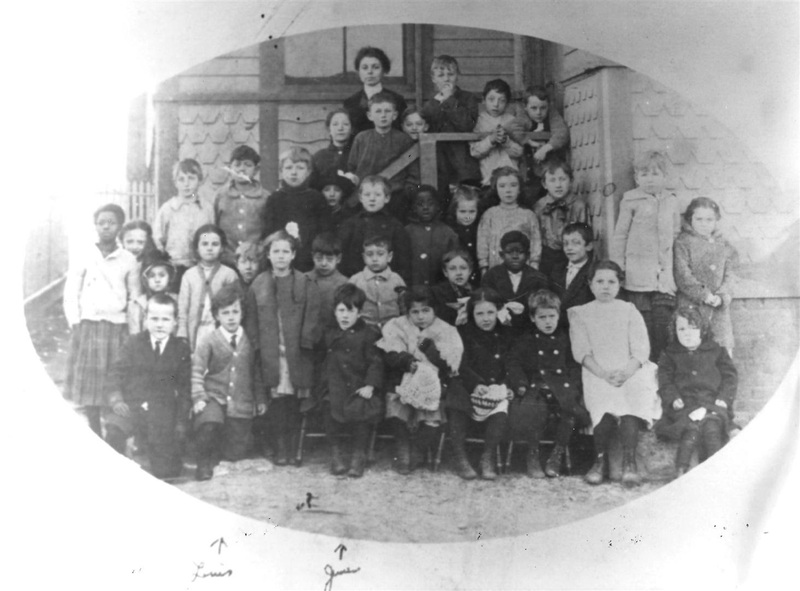 A class outside of the school building with teacher Miss Peggy Rice, 1913. Courtesy Lyndhurst Historical Society. The Township of Lyndhurst was established in 1917. Prior to the 1880s, it had been part of a much larger township, called Union, which included the towns of Rutherford, East Rutherford, and North Arlington, which became independent communities in 1881, 1889, and 1896, respectively. In 1917, an election was held to change the name from Union to Lyndhurst, which was approved by a vote of 747 to 178. At the time of its renaming and reorganization, Lyndhurst educated its students in four schools: Lincoln, (built in 1888), Franklin (1907), Washington (1913), and the River Road School (1893). Like most one-room schools, all students were taught together. Typically, the room was separated by gender, with boys on one side and girls on the other. Basic education included reading, writing, and arithmetic. A single stove provided heat for the building. A home next to the school, the Jeremiah Yearance House, circa 1841, is significant to interpreting the school and transportation at that time. It is recorded that teachers often boarded at this home during the week because their commute by train to their homes was too far. The Jeremiah Yearance House, circa 1841. The River Road School was used by the school district until 1980. Just a few years prior, it had been placed on the State and National Registers of Historic Places in 1976 and 1977, respectively. In 1984, it was purchased by the Township of Lyndhurst and leased to the Historical Society for use as a museum. During restoration, the newer chalkboards were removed from the walls, which revealed earlier boards underneath. Two of the earlier chalkboards still retained chalk drawings on them! One was of Little Red Riding Hood and the other of Goldilocks and the Three Bears. The drawings were conserved and preserved with a protective coating. Preserved drawings left behind before new chalkboards were installed - most likely 1930s. Today, this meticulously restored building features changing exhibits on Lyndhurst's history on one side of the room, while the other side is set up to represent a classroom, circa 1900. The original bell from the second school building still rests atop the tower and can be rung by curious visitors!